With our highly anticipated November trunk show event Sip & Style, right around the corner, we thought it would be the perfect time to highlight some of our absolute favorite new pieces from the talented, Colorado-based accessories designer Sara Gabriel! Who wouldn’t fall in love with this perfect pair of vintage chandelier earrings? For any bride looking to make a statement as they walk down the aisle, these are the perfect choice. Not only will they be a show stopper on your big day, but they are the perfect addition to any date nights with your new hubby later on! The Bridalistas here at Blue can’t wait to see these beauties in person, coming to us soon, in champagne. 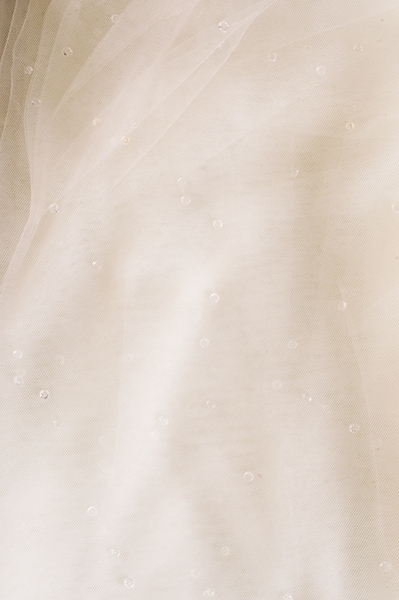 We can not stop swooning over these translucent sparkles, and how could you after seeing the gorgeous detailing on this new veil! This classic shaped Signature Tulle veil, features a twinkling bundle of clear Swarovski crystals at the crown that gradually fade. The perfect addition for all our brides looking for a fingertip, knee length, or cathedral length veil that has just a touch of soft beading! The hair piece frenzy continues, and we could not be any happier about it! Many of our brides come in looking for a beautiful hair piece either to add a special touch to their veil, or to complete their look entirely! With an enormous selection of gorgeous hair vines, wraps, headbands, and tiaras it can be overwhelming to narrow it down to the perfect piece. Now with this new Ciara hair ribbon, brides don’t have to! This gorgeous ribbon is encrusted with Swarovski rhinestones/crystals, and has light touches of stunning flower petals and embroidered silver leaf detailing. 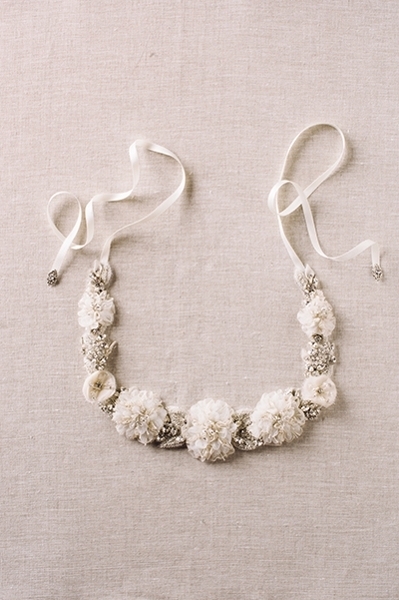 This duet ribbon can also be worn as a sash and is the perfect touch for brides wanting a nature inspired look! 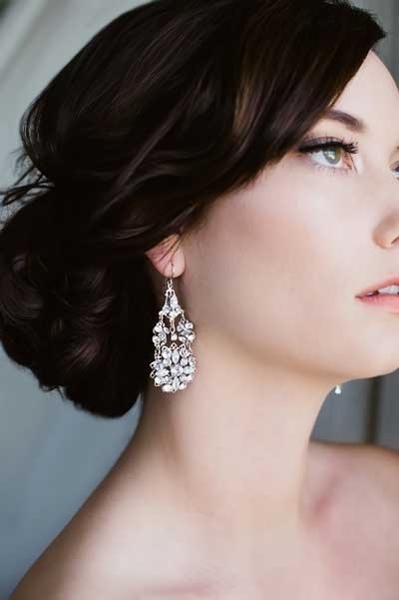 When it comes to picking the perfect jewelry to compliment the style, shape, and overall look a bride wants her wedding dress to create, the options can be daunting. Finding a unique piece like the Daphne is a wish granted! This gorgeous intricately hand beaded brooch-style center bracelet is a stand out accent. Perfect for any bride looking to combine the elegance and grace of pearls with the glamour of some perfectly placed bling! If you are looking for a unique veil to complement your dream dress, and complete your vision, look no further! This soft, sweet, two-tiered veil with light lace appliques near the edge is the perfect mix of the classic lace look with a bit of a modern touch. 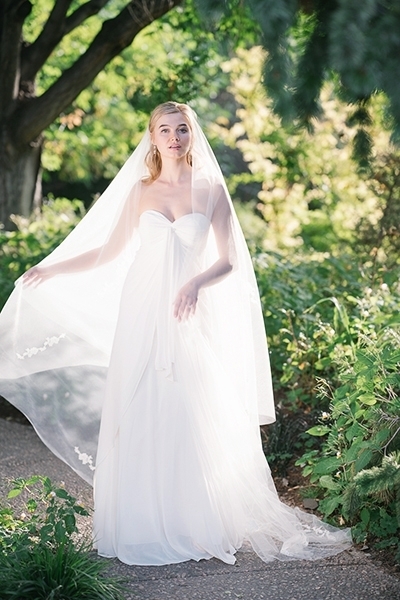 For the bride who is looking to really add a pop of color this veil is also coming to us with black lace!